Different customers have different default configuration and pricing for the same product. In many systems, you are forced to create different products for these different groups. For example, Widget, Widget-Resellers, and Widget-Acme are all the same product, but are created as unique products to accommodate the different customer groups. Control uses pricing plans to establish different prices/values for the same product for different customers/customer groups. The correct pricing and values are automatically chosen based on the customer selected for the order or estimate. From the Pricing Plan Screen located in the Setup/Pricing/Pricing Plan category, you can click on Add or Delete plans to create or get rid of customized pricing plans. You can enter in a name for each plan as well as a description for your reference. The Screen Shot below shows 3 Pricing Plans, the one selected being “EStore” In the Company Setup Screen the Pricing Plan selection for that company is located in the Upper Right hand corner with the Discount and Promotional Codes. Each Product has an option to include different pricing formulas for each plan, including different Income Accounts, as shown in a Screen Shot below. To add a Pricing Plan option to a Product, click on the Tab. This will bring up a selection menu to choose from the list of Pricing Plans you have created as shown above. You may enter a completely different formula in the formula options below than the formula for, in this case, “Acorn General”. Companies with the Acorn General Pricing Plan will have the product priced according to that formula. Those with the EStore Pricing Plan will be priced according to its formula. Note that you can select different Income Accounts as well which gives you enormous flexibility to use the same “product” in many different ways. Screen Shot Showing the Pricing Plan Setup For the Product. The Screen Shot Below shows the Customer Screen where you select the Pricing Plan. Pricing plans remove complexity in your pricing. In Control, every product has a default pricing plan. If the company uses a pricing plan that you have not set up for that product, Control just uses the default. Therefore, you can start classifying your customers by pricing plans from the very beginning. The key to managing pricing plans is to establish them early even before all of your pricing is final. You can start classifying your customers with very little work long before you establish separate pricing for them. All you need to do is enter a name! You do this from the General tab of the company. If Customer Group A always orders red widgets, and Customer Group B always orders blue widgets, we can use the pricing plan to change the default values automatically. You will have to re-enter the pricing for each pricing plan, even if the pricing is the same, but the options will then switch automatically based on User. 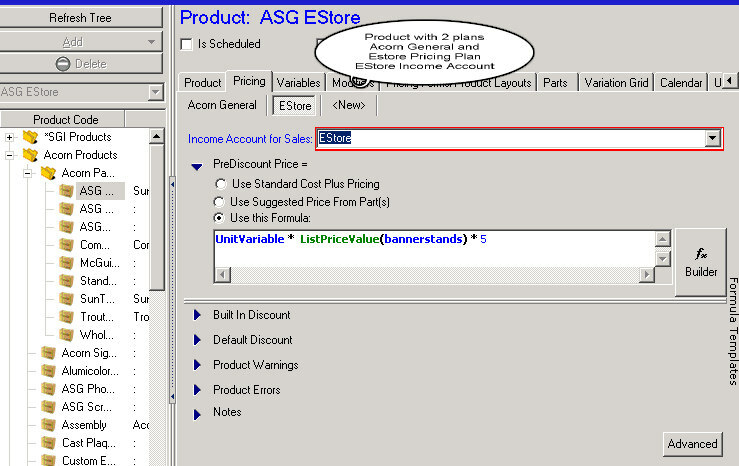 The default values for a variable are set automatically when the product is initially created. In the event the User is not entered, the default pricing plan will apply. If you later enter a customer with a different pricing plan, the default values will not be overridden and the original values will still apply. To avoid this, you should enter all values as formulas in the formula box (“Red” and “Blue” in this case). Then, as long as the User does not manually override the value, if the pricing plan of the customer changed, the new value calculated from the formula will apply. While it is possible to use pricing plans for sales tracking, this is not a recommended use for the function. Instead, create a User-defined field, or use divisions if applicable.